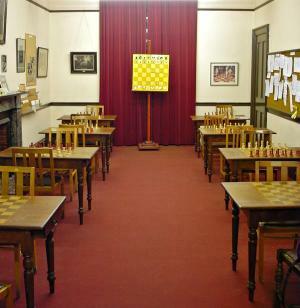 The country's senior chess club offers a warm welcome to everyone wishing to visit our West End clubrooms. Established in 1822 and now approaching its bicentenary it is not only the oldest club in Scotland and the UK but probably the second-oldest club in the world. (Zurich is believed to be the oldest est. 1809) The Edinburgh Chess Club is proud of its heritage and is happy to entertain chess enthusiasts from all over the world - in person as well as here on the web site. We are equally glad to see local players who wish to take advantage of our clubroom facilities to play more often - whether they wish to play for us in the leagues as full members, wish to play only in our tournaments, or merely play casual chess as affiliate members. We offer training and coaching to junior players and the chance to play in our Tiger Cubs junior team in the Edinburgh League. We hope you'll find the club a stimulating place to pursue the game.